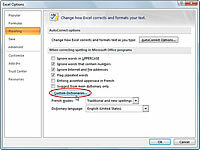 In Excel 2007, you can create custom dictionaries to use when spell checking your worksheets. 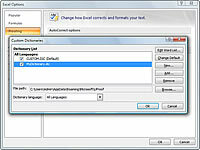 You use the Add to Dictionary button in the Spelling dialog box to add unknown words to a custom dictionary. By default, Excel adds these words to a custom dictionary file named CUSTOM.DIC, but you can create a new custom dictionary to use as the default, if you prefer. 2Click the Proofing tab and then click the Custom Dictionaries button. 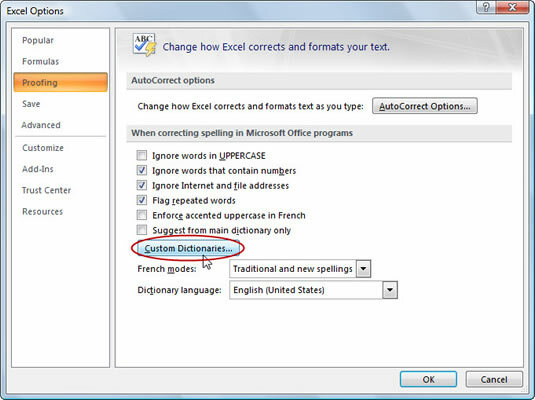 Excel opens the Custom Dictionaries dialog box, where you can create a new custom dictionary. 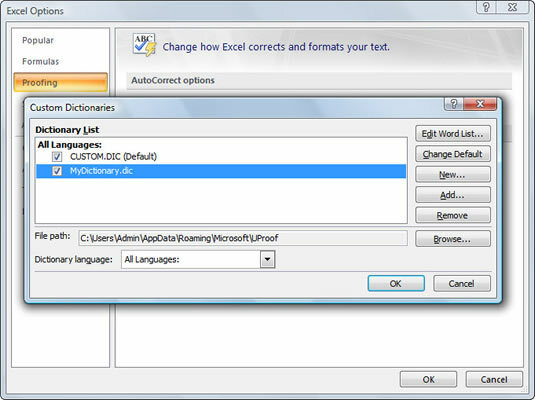 Excel opens the Create Custom Dictionary dialog box. 4Type the name for your new custom dictionary and then click the Save button. The name of the custom dictionary you created appears underneath CUSTOM.DIC (Default) in the Dictionary List box. 5(Optional) Click the dictionary’s name in the Dictionary List box and then click the Change Default button. This makes the new custom dictionary the default dictionary into which new words are saved. Both dialog boxes close and Excel returns you to the worksheet.